This giveaway is closed. Thanks for entering! See who won here. Everyone hates those bright yellow dandelions sprouting up in their yard. But who can resist those puffy seed balls that form after. I understand they’re only spreading dandelions, but they’re adorable. And even more adorable are these napkins from Lemonade Makin’ Mama. While I like the orange, I thought the metallic silver was perfection. 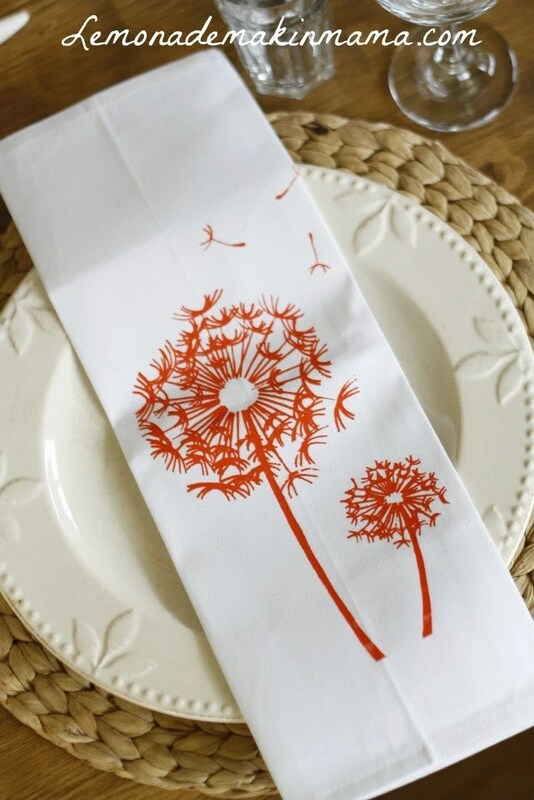 Each napkin has two dandelions with several floating seeds. Those little floating seeds are my favorite part. Oh, and the metallic sheen. These beauties can be yours, so read the details below to enter. The Goods: One set of silver dandelion napkins from Lemonade Makin’ Mama. Just for Fun: What do find irresistibly adorable? Babies? Puppies? Buttons? Contest Closes: Thursday, August 9th at 11:59 pm, central time. Other Info: We will select the winner using random.org and announce on Friday, August 10th. Good luck!! these are beautiful!! and I do love babies!! What is the name and maker of the plate the napkin is lying over? So cute! I can’t resist little kittens (or any little animal really). Love the silver! I find many things adorable but would have to say that babies are my favorite. Especially my grandson! Beautiful! I love puppies and kittens! Ever since adopting my dog last year, I know find all puppies absolutely adorable! Those are adorable! How do you find all of this amazing stuff! I could oogle over babies and puppies all day long! Babies!! What is not adorable about babies?! Love those napkins! I’m going to have to give my vote to babies for most adorable. Love these! So so so cute! How timely! I was thinking about converting to cloth napkins…these would be a good start! Cute…baby noises. I was sitting next to a friend who was nursing the other day and I could hear all the baby’s happy noises! I’m seriously obsessed with anything small. Small cups, small nail polish, small puppies, small pillows, small anything. I could live in a mini sized world 🙂 on another note…. I love the napkins, they are beautiful!!! Kittens. I can’t even walk by the cages in the petstore witout feeling like I need to take at least one home. Love the napkins! I would have to say children are adorable. Of course, I’m partial to my three! These are GORGEOUS! What do I find adorable? My cat, Ed. He’s the cutest!! Super cute. Show me a dog (especially a beagle or cattle dog) and I am done for. my 10 month old grandson likes to climb into the dog kennel with our boston terrier and lay his head on the dog. anything in miniature. this includes, but is not limited to: babies, ponies, bite sized candy bars, tiny office supplies, and kittens. all adorable. It’s hard to decide between a puppy pile (when puppies all cuddle in close and sleep on each other) and baby toes. I don’t know what it is about little chubby toes on a baby, but they are irresistible. Kittens are their too big ears are so cute! Cute napkins! We are an “all cloth napkin” household and have been for years (no paper plates or paper towels either). I highly recommend it – just wash the napkins along with my other laundry and I even have space to store them! Love my cute little great-nieces! These are so pretty! I love when babies have just had a bath with Johnson’s baby lotion and footie jammies. So cute, and they smell nice too. Black lab puppies are irrestistably adorable! I can’t help cooing over baby sea turtles. The cutest! Love the napkins! As for adorable? Have to say the kiddos! I love penguins. Any kind of penguin. They are all awesome on a level that nothing can touch. Cute napkins. My dd is the most adorable, of course! Kittens. And newborn babies. Oh, puppies too. And maybe kids in a swimming pool. Okay, you got me – cheesecake. I think it is hard to find a puppy that isn’t adorable. I can’t get enough of foxes! I totally want one as a pet! Love the napkins! I find babies and kittens adorable!! Have to say newborn babies! Wow! what miracles they are! I can’t resist little kittens or puppies. My babies toes and kids in furry/fleece animal costumes. Definitely babies! The napkins aren’t too bad either! I’m a puppy person all the way! I love an awkward puppy with big paws. I think kitten videos are the cutest thing in the world. I love the napkins too!!! I think there’s nothing cuter than a toddler learning to toddle. I’m a sucker for anything cute and cuddly…babies, puppies, etc. My new Australian Shepard, Bindi…she is soooo adorable! I find kids from about 2-6 so adorable I can’t help but smile when I see them acting crazy! Baby sloths are the cutest things in the entire world. I highly recommend spending hours watching videos of them on youtube. I love both babies and puppies. I think puppies and turtles are the cutest! Also, in terms of house-related stuff, I’m unable to resist a good piece of glassware. I love newborn babies… they’re so adorable! I find baby coos simply adorable. This are fabulous!! I can’t resist any kind of animal baby! I almost don’t want to put it down because I’d love to be original but I have to admit – I trip over myself to pet a cute puppy. I love them. I am obsessed with Golden Retrievers. Puppies, Older ones, whatever. They’re just so cute and sweet!! Those are perfect for my brand new kitchen! I too drool over metallics! My daughter (of course), though i have to keep reminding myself that only my husband and mother can stand looking at EVERY picture to relive the adorableness every day . . . I love the orange napkins. The cutest thing in the world to me are piglets. I think kids in animal Halloween costumes are to die for :)) thanks for the chance! I am loving all things baby as we get ready to have our first next month! Love these! I think cat paws are adorable…love them! Those are pretty! I think my hubby is irresistibly adorable!! Love these napkins! And chubby baby thighs are so adorable! I get really excited about french linens. I absolutely love them!